I love making custom receiving blankets for friends expecting a baby, and they have always really loved getting them. Now that I’m expecting, I’m looking forward to making some for my own little one. Not only are these easy-as-pie gifts to stitch up, but small prints and plain colors are perfect blank canvases for embroidery. All you need is some soft, cozy cotton flannel in your choice of print or color (1 yard will do, but buying 1 1/4 yards makes the blanket into a perfect square). 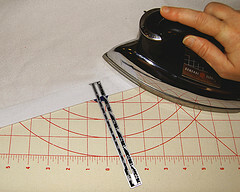 Step one, finish all four sides with a 1/2″ hem; turn under and press 1″ of fabric to the wrong side, then turn under and pin. 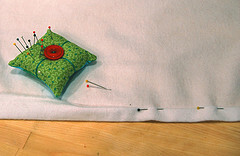 Step two, stitch along the edge to hem up the blanket using a straight stitch or a fancy, decorative stitch. 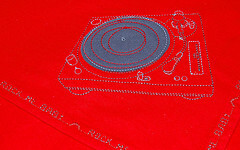 If you’re using a super-cool print or you want a plain blanket, then you’re done! This is a blanket I made with a tea set design print, and I used the lettering stitch feature on my Bernina to add a little message to the hem. These blankets are also great for embroidery! Here’s a blanket I’m putting together for a BERNINA project using Oklahoma Embroidery Supply and Design’s pack #12195 Baby 12. And you don’t have to stick to baby designs. This blanket is embroidered with a Hope Yoder design, Nashville Lace. I changed the thread colors to different shades of pink, and the corner will be perfect for a monogram (when we finally decide on a name!). When embroidering on flannel, use a polymesh cut-away stabilizer next to the fabric—it will help to keep the stitching from distorting through many washes, and it will stay nice and soft for cuddling. It’s also a good idea to use Isacord polyester thread on these blankets since it is made to be tough and colorfast. And most of all, have fun creating your one-of-a-kind gift that will surely be treasured and cuddled for a long time to come. Previous Previous post: T-Shirt Makeover – Maternity Style!